A satirical video clip of a donkey posing as Nicolas Maduro being led through a fire station in Mérida has caused some resurrection in Venezuela. In the video the narrator indicates that the donkey is president Maduro doing an “inspection” of the fire station. The video is unfortunately not the most bizarre part of this story. A couple of days after the publication of the video, on 12 September, the two firemen behind the video, Ricardo Prieto and Carlos Varón, were detained by the Directorate General of Military Counterintelligence (DGCIM). On the hearing that was held on 16 September, the two were accused of “instigating hatred”. Currently they are deprived of their freedom waiting for their penalty and risk facing up to 20 years in prison for their satirical piece. The crime they are accused of referrers to a law published by the National Constituent Assembly (ANC) in November, 2017 called Constitutional Law against hatred (la Ley contra el Odio). The law is being criticised by the Venezuelan human rights organisation Foro Penal and other Human Rights actors for being nothing but an instrument for criminalising dissidents. The pattern is familiar, as a matter of fact this is not even the first case where animals and human rights intersect in a satirical way. 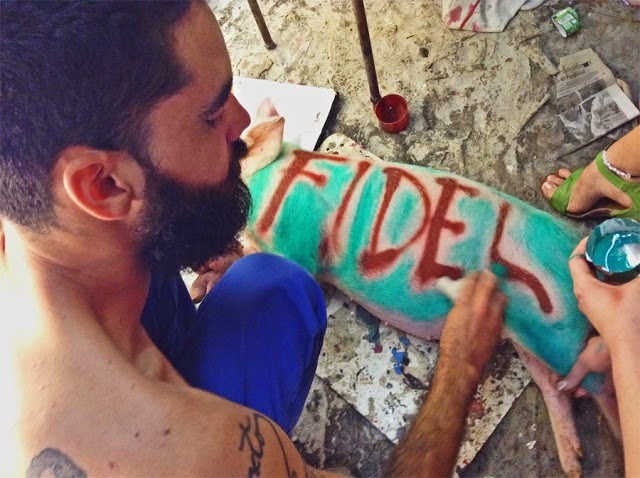 A similar story unfolded in Cuba in December, 2014 when graffiti artist “El Sexto” was imprisoned without trial for having planned a performance piece containing two pigs with the names Raúl and Fidel written on their sides. The crime he was accused of was “disrespecting the leaders of the revolution” and he ended up spending ten months in prison. Whether it is a case of comedy or art, it should not be a crime to make a joke about the president. However, in both Venezuela and Cuba the situation for people speaking out against their governments has been a severe problem for many years. According to numbers presented by Foro Penal there are 236 political prisoners being held in Venezuela, and only during 2018 they registered 452 arbitrary detentions in the country. Similarly, the Cuban Commission on Human Rights and National Reconciliation, whose data is accessible in the Defenders’ Database, have reported 4 267 incidents of arbitrary detentions of Cuban democracy activists since El Sexto painted his pigs four years ago.